Yes, this post is a sequel. If you wish to know what happened previously, Click here to read Part-1 of the log. So, anyway, I wake up to this date. Waking up early had been a rare thing in past so many days, but I had to for this once. And may the force be with me for the next weeks. Got read, packed my stuff. Cellphone – check. Backup phone – check. Laptop – check. Internet – check. Backup internet – check. Backup of backup internet – check for sure! Reported to Jatan office from where we went to receive our guests at the airport. After getting comfortable, having breakfast, began our day of introductions and local sightseeing. We went to places like Fatehsagar (yes who can miss that in Udaipur), Pichola lake, Saheliyo ki Bari (thanks to the project, haven’t been there since childhood days) and a few more. People were friendly, as well as there were a few familiar voices with whom we had been talking to from months, just turned into faces. We gelled just quite well. 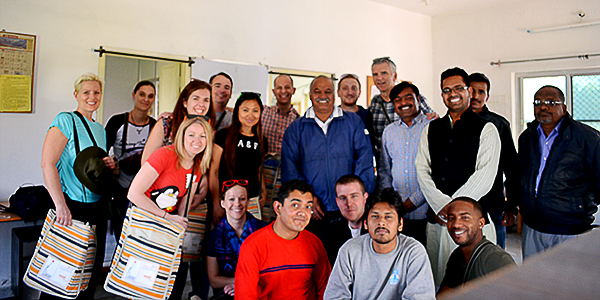 After a few places visited we came to the Jatan office in Udaipur, where we took a high tea halt, Kailash ji, founder, Jatan Sansthan gave a briefing about Jatan’s ideologies, work areas, and provided all of us with souvenir kit. Merrily, we departed for Railmagra. After settling them into their prebaked hotel at Rajsamand, I and Rajat were escorted to Jatan’s Railmagra office, the place from where Jatan began its journey. To my surprise there already were a few people I already knew. Food was ready and after having dinner we headed back to the guest house situated at a walking distance from the office. The day that marked the beginning of a new experience came to an end. Obviously the next morning. So, here’s the drill: get up early, err bit even earlier. There would be power outage from 7 a.m. to 9 a.m. So you need to get up at about 6, so that you can utilize the water heater in winters. If you are lucky enough, you’ll get hot water and yourself at the first in the queue. Wait. Hold on for a second. There are two bathrooms and three of us roomies (me, Rajat and Bhupen from Jatan Railmagra), how can there be luck factor and queue? “Notice the other room nearby? There are more guests. A group of girls from Indian Institute of Management, Udaipur (IIM-U) out here for rural exploration/study etc. Hence one of the bathroom is reserved for them. We have only one bathroom for us.” Okay fine. So I’m trying to keep myself awake, getting up the earliest, and water is about to heat to the right temperature, and the door slams. Wait, what? A girl already went to the bathroom because theirs was occupied by some other girl. I thought I was the first. Yes, I became the first one ‘in the queue’. I suddenly got the first hand experience of how general category feels in competitive exams vis-à-vis the reserved category. With all due respect and no offence meant to hurt anybody, all this was in plain humor. I knew I was going to enjoy this pseudo-college hostel fun. Finally anyway got ready, left for the Jatan office, had breakfast and everyone was welcomed, greeted in the Rajasthani style, and we discussed what is to be done. We were then taken to a construction site in a small village ‘Pachamta’. This had to be a building where there would be an e-Lab out of the four as proposed in the project. The Softchoice team was to volunteer into building that building! Quite admirable. That day we split up in teams of three, and worked along with the masons and labourers, helping them in the construction of the building. Hadn’t moved out of my chair for long, so that day was a tiresome to say the least. Softchoice team does have a stamina, to add. From the next day onwards, a part of team would stay with me at the Jatan office to set up the computers, activating them, setting up servers, setting up the network schematics, etc. 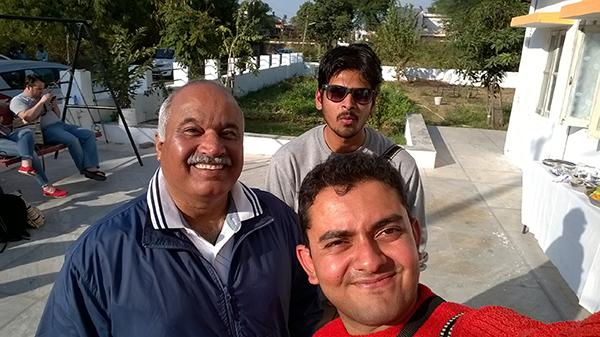 and rest of the team would go to the construction site at Pachamta with Rajat. This would add to the daily drill. Setting up a network here in Railmagra for the e-Lab was quite a challenge for the Softchoice team. For a country that works at 4G speeds, setting up a network in sub 2G speeds, as well as a place where power outages are quite common, is a big challenge. To my surprise, the entire Softchoice team never came across “Inverter” as a device. Maybe an Asian jugaad it is which isn’t needed in that part of the world. Dan from Softchoice is a real genius at networks. He is more than forty years old (oops if I wasn’t supposed to leak it), and carries the energy of a 20 year old. We just kept talking and talking about networks, IT, hardware, etc and the differences between the systems in India and Canada. Subsequently, we did need to change the network schematic owing to the slower internet connection. Ranveer ji from Jatan came to the rescue at the right moment to inquire various agencies for a faster internet connection that could set things better. Every evening, we would go to some place/village for exploring Rajasthan in detail. I did mention ‘exploring’ as I already mentioned, everything was as new to me as it was to them. Have been to rural West Bengal, but everything there and here are far different. 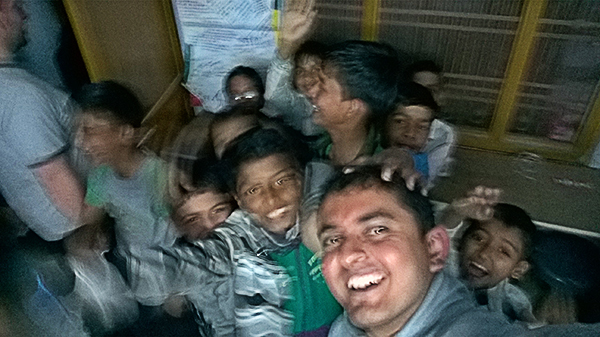 One evening we went to a youth group meeting with the kids in Pachamta village where they discussed the ambitions and aspirations of the local village kids and announced the good news of the upcoming eLabs for them. 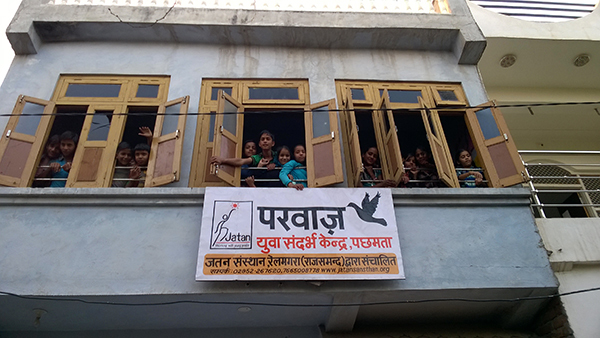 The kids were really happy and excited from the news that they can have access to knowledge at an accessible location. You don’t always see foreigners in a remote village, so they were surprised as well. They asked a lot of questions, ranging from “what do you people eat there”, to “how are we going to benefit”. Softchoice team was moved by the session, I must say. They had been putting their efforts for the right cause, I must add. We clicked a lot of selfies with the kids and then returned. Everyday after returning, while everyone else would go to sleep, I would stay awake and work. Apart from my upcoming presentation, I had a design project in hand, the deal for which closed coincidentally after I reached Railmagra. Work triple jobs a day. Sleep, see you some other day. Rajat did use to repeat a phrase, “jeevan sangharsh hai (Life’s a struggle)”. Felt true to some extent. Next day same drill continues, only for a difference the teams were taken to a meeting with women group and PRI members, for knowing the situation of women better in the village, as well as the family situations. Slowly a lot of crowd emerged and every woman actively participated in discussion. The meeting was held in Lapsya village. A lot of questions were exchanged between the women from Canada and women from Lapsya. Speaking of societal evils, such as domestic violence, etc. women face them whether they are in Lapsya or Canada. That puts everything related to development in question. We just do not need to develop or evolve technologically. We also do need to evolve in our thought processes. Though in lesser numbers, but if women are facing problem in developed countries as well, then to what benchmark are the developing nations proceeding? Well that question can be answered only with time. This week was ending and I was due in Jatan’s Udaipur office for some other consultation requirement. My hefty time schedule comes to an end. One thing if I could regret was, I couldn’t be with the Railmagra-Softchoice team for the next week. Early morning, I and Krishna from Jatan take a multiple lifts to reach Udaipur. Directly reported to Jatan office. One large cup of black coffee as my breakfast and I was green to go with another file in my hand, and a lot of memories in my mind. Speaking of the takeaways, first of all I had made some really wonderful friends in Railmagra and from Softchoice. Realized that my spoken English isn’t that bad too. Kan ji, who used to make us food, to Ranveer ji, who used to take care of entire Jatan at Railmagra. Ranveer ji used to share some great incidents from his younger days that kept us amazed. Not to forget the energy of Rajat, Nick and Dan, entire Softchoice team’s warm and friendly nature, Tammy who was always eager to learn new phrases in Hindi and took notes, to sessions on ‘how to eat chapati with hands’. Getting to know about things and cultures in Canada, I found another fellow fitness lover in Charo and a Chris Nolan movie lover in Chris Roberts, and Tara, who was surprised to find a meaning of her name here in India. Entire trip was just wow! I carried a truckload of memories. Speaking of other takeaways, this was first time I lived with a room-mate at a remote place (at least I thought so). The experience was a fun and a takeaway in itself, but taught me that things are never that bad as fearful they appear at first from a distance (maybe because the internet was working well in the evenings, else I could have other opinions too). I got to explore the rural Rajasthan in detail. And that too, from the eyes of people who were guest to the country. I realized how colorful and vivid our country is. We sadly wish to upgrade to urban lifestyle but that’s a rather plain jane. We, however live a far more colorful life and closer to the nature. Something we should be proud of. Social evils prevail everywhere, its just the quantity. In India they might be more, but again we have a population of a billion plus people. Its on us, the living beings to evolve and come past these social evils. Besides the colors and vividity, I got to see the problems our people face which are elementary in nature. To strengthen them would take a lot of efforts, but it would empower us as a nation in a longer run. For a better education, knowledge enhancement and connectivity of rural India, the efforts taken by Softchoice is commendable. I personally wish Jatan and Softchoice all the very best for every future endeavour. Now, was the decision wise? Something always gives way to something better to come. 2014 ends on a good note, and here it is 2015. Standing tall on my face. Yes I know I haven’t saved the world yet in past some time, and I intend not to, the world should be mature enough to take its own care. What rather has been intriguing that 2014 ended with a few good memories, a long travel, and a path that led me to 2015. Speaking of 2015, a month passed just like that, and its February already. Being an explorer, the focus certainly remains on exploring something. Till now I have been exploring something or else in the tech world, my only escape/exception in past two years being my trip in June 2014. As it is said, ‘be careful what you wish for’, came true in a positive way. Rewind a few weeks back, one fine morning I got a call from members at Jatan Sansthan, that they have a project coming where I could help them with to initiate. The project was regarding setting up of e-labs for social welfare in few blocks of Railmagra which falls in Rajsamand district of Rajasthan in India. Now, Jatan Sansthan has been next to a family to me. It has been quite sometime I’ve been working with them, helping them with my skills as and when required. About my experiences and learnings from Jatan, I’d be writing entire series of blogposts soon, stay tuned for them. Hence, without asking much about the whereabouts of the projects, I said a yes to them. Then began a series of video/audio conference calls from the folks at India to the folks at Toronto, Canada. These calls were mostly targeted towards the configuration of the hardware required, facilities available and expected, etc as the team would bring with them the equipment from Canada. Fast forward again to the month of February, first two days of the month were really full of dilemma. The project demanded me to go on-field at Railmagra, where the folks from Toronto with whom we’ve been talking to would be joining us. I had a few personal and professional commitments along with which the dates for the project were clashing. Hence, I was refraining a bit to agree to go on-field. “But this is something new and challenging”, said my heart. Yes. The heart again gave a powerful statement. I did all the recalculations, managed clashing dates, planned to work for other things remotely after the workday at Railmagra gets over. That said, lets fix it! The brain kept asking, was it a wise decision? Rajsamand itself has somewhat lesser than acceptable internet connectivity, Railmagra is an even further remote place, what about that? What if internet doesn’t work there properly? Everything else would get doomed. Having a lot on head, as well as an upcoming presentation/lecture at IIM-U had to be prepared right at Railmagra itself. What if there isn’t proper electricity itself? “Chuck it”, the heart said. So I was finally onboard. Now I was at peace to go through the entire file of the subject. So as it turns out, participating the project was the 25+ year old IT giant from Canada, Softchoice Corporation. For the benefit of rural children and their effective education in developing nations such as India, Softchoice Cares, the CSR wing of Softchoice Corporation decided to set up four e-Labs in the district of Rajasthan, India. For the same, it decided to join hands with Jatan Sansthan, a grassroots organization that has a name and trust among people for its works. 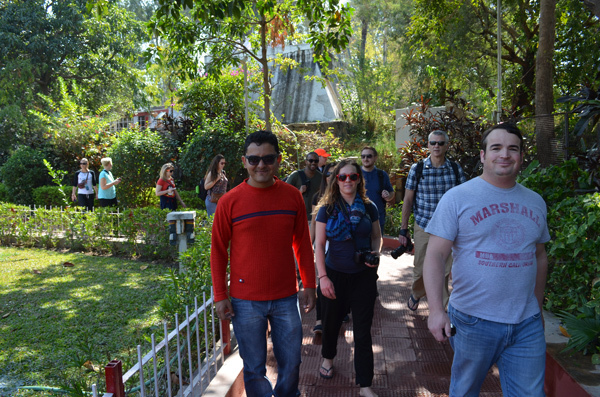 Under the programme, a team of 12 board members from Softchoice Corporation visited India under the leadership of Robert ‘Nick’ Foster in February 2015. Pre-arrival, a thorough series of video conference calls started months before the actual date to get a grasp of the Indian environment, from both viewpoints of the setup of eLabs and the climate, etc. about which I already mentioned above. So, Railmagra and the entire experience is going to be as new to me as to them. I will be going to have a small trip with them, where I would be accompanied by a trip facilitator and would be staying at Jatan’s guest house with him. A wish of staying in a hostel with a fellow roomie coming true years after the college life ended. What an irony! It is 7th February, just a day before I’d meet the team, I and the to-be roommate were called at Jatan’s office for the briefing and getting acquainted. And what a surprise! He turns out to be my old college mate, Rajat Paliwal. Better than someone totally unknown in an unknown place. So, we are given the proper instructions, made aware of the time table, schedules to be followed, with precautionary do’s and don’ts. Excited and eager, I was looking forward to the next day. Would my decision be a wise decision? Tough call judging in advance. Gotta be a sleepless night tonight.